Article first published in the Journal of European Baptist Studies vol. 19, 2018 (IBTSC, Amsterdam). 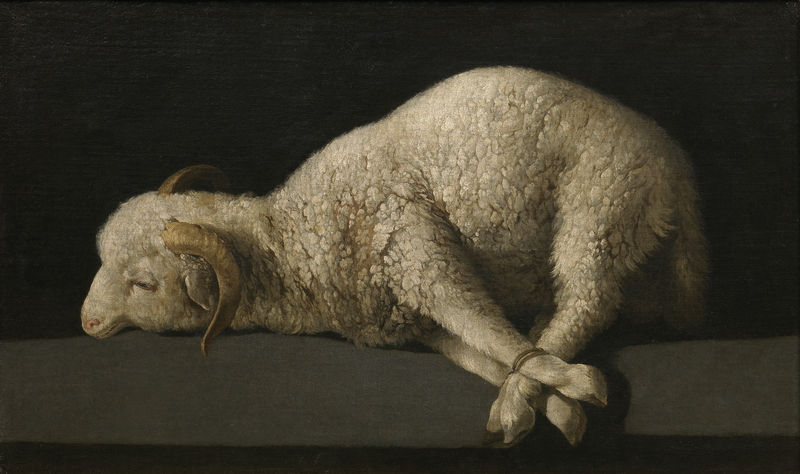 Francisco de Zurbarán, Agnus Dei (1635-40). Quite a few Baptists before the 19th century defended a peculiar understanding of justification often known as ‘justification from eternity’. This doctrine played a central role for English Particular Baptists such as Samuel Richardson and John Gill, who held a radical monergism, where the elect are efficiently justified by the work of God even before coming to faith. As this minimizes the role of the law and repentance in justification, the doctrine is often criticized for leading to anti-nomianism and for reducing history to a mere mirror of eternal truths. If justification is from eternity, there is no motivation for evangelizing, critics argue. The article considers these objections, and argues for a reconstruction of the doctrine using an understanding of eternity and time, that does not assume the metaphysics of classical theism. The doctrine might further be developed in a non-particularistic framework, allowing a greater emphasis on evangelization ‘here in time’. Modern evangelicalism can to a large degree be said to subscribe to the idea that human beings are only justified before God in the moment they repent and exercise what is sometimes called ‘saving faith’. A well-known kliché is the one about ‘inviting Jesus into your heart’ or saying the sinners prayer. According to a study by LifeWay, a surprising majority of self-identifying American evangelicals believe that individuals must contribute to their own salvation by taking the first step in salvation.1 This is not only relevant in an American context, but also in a European and Global evangelicalism still fashioned by the heritage of the ‘Great Awakenings’. It is not hard to see why classical reformation slogans like sola fide has so often be misunderstood as statements about the ability of faith to create its object. But if the gospel has simply become the ‘good news’ about the inherent creative potential of human beings’ own faith, it hardly offers any real alternative to the rampant subjectivism and relativism of our age. The claim that God’s unconditional love is nevertheless conditional on how we receive it, is not just baffling for many non-churched, but also comes uncannily close to being a downright denial of the efficiency of the cross. Hence, there may be good reasons for seeking an alternative understanding of the relationship between faith and justification. This is where the doctrine of justification from eternity becomes useful. According to this doctrine, as developed by 17th-18th century Baptists against the over-emphasis on repentance in Puritan and missional conceptions of faith, the subjective exercise of faith can never be a contributing cause of justification. Justification is a fact prior to repentance and faith. As such the doctrine of justification from eternity offers an alternative to the widespread modern and post-modern superstitions of human autonomy, as well as the sentimentalism and eroticism of popular neo-calvinism, that only inadequately remedies the former.2 The radical monergism implicit in the doctrine means that the human will is in no way instrumental in justification. The debate about the time of justification is far from just being a matter of speculation. It is relevant for practical theology, as it raises questions for mission and evangelism: Is preaching imperative for saving people or is it rather the joyful revelation of something which is already true about our existence? The doctrine of justification from eternity suggests the latter. The gospel is not an obligation we are invited or urged to fulfill, a chance or an offer made to us, but an announcement and a promise (Barth).3 Thus the efforts of the church are released to be a celebration of the gospel rather than a busy and desperate attempt at saving as many souls as possible before Christ returns. The doctrine of justification from eternity has, however, for good reasons, been criticized for leading to passivity in regards to evangelization and mission: Why preach if people are justified before even hearing the gospel? But rather than modifying the radical monergism behind the doctrine, as was done historically, when missional theology took the lead in Baptist thinking, there are other possible approaches. If the notion of justification from eternity is to be recovered, without once more ending up in the pitfalls of a too anti-missionary skepticism about the church’s efforts of preaching the gospel to the world, the doctrine must be freed from the particularistic soteriological framework in which it was often developed by earlier Baptists. Moreover, before doing this, I will suggest a revised understanding of the relationship between eternity and time, as a way to avoid the charges of making history a mere mirror of eternal truths. Most important for later Baptists seems to have been the Anglican incumbent theologian and preacher Tobias Crisp (1600-1643) who developed what David Parnham has called a “covenantal quietism” against the legitimacy of “a pietistic tradition that was overly elaborated and destructive of souls”.7 Following Hebrews 8, Crisp saw the promise of a new covenant in Jeremiah 31 as fulfilled with the ministry of Christ, rendering the function of the divine ‘law’ as a necessary means to conviction of sins obsolete. The conviction of sins, conversion and faith, are not conditions of justification, but at most the result thereof, making the role of the ‘law’ (the Mosaic law as well as the natural law) in the traditional protestant scheme of law and gospel of less importance. Crisp held to a strict monergism, where justification and salvation is the work of God alone. It is not human obedience and holiness that justifies and saves: “I must tell you, all this sanctification of life is not a jot the way of that justified person to heaven”, Crisp famously asserted. The justification of the sinner takes place in the new covenant before the sinner is even aware of it. Faith is not a cause of justification, but the manifestation of it. Crisp is reported to have said that “The elect are justified from eternity, at Christ’s death; and the latest time is before we are born.”8 It may seem that Crisp was not fully decided on when justification actually took place, though for him the main concern must have been, that it happened “before we are born”, and as such prior to repentance and faith. Crisp’s radical monergism became influential in independent church life. The idea that the elect are justified before having faith, and perhaps even “from eternity”, seems to have gained an early influence over English Baptists. Among these were Samuel Richardson (c. 1602-1658), who with eleven others signed the 1644 and the 1646 London Confessions of Faith.9 In his treatise Justification by Christ Alone, Richardson denied that faith is any means of “Redemption, Justification, or Salvation.”10 Christ alone is the means of salvation. Justification is fully achieved on the cross and never depends on human faith or works. We are justified by Christ alone and not by our believing. The preaching of ministers is a means to reveal justification, says Richardson, but not instrumental in the justification of the elect. Faith and repentance can only be considered results of the Holy Spirit’s work in those who are already justified. Faith is an evidence of “interest in Christ”, but not a “joint-partner with Christ”. Against the objection that justification in the New Testament often depends on the exercise of faith, Richardson explains that faith is diversely understood in Scripture. While sometimes it means knowledge or belief, it can also mean doctrine or the object of faith. In many cases faith is “put for Christ”, says Richardson. When Scripture says that we are “justified by faith”, that we are “saved by faith” and so on, this means that we are justified and saved by Christ, as what is really proper to Christ is in Scripture often attributed to faith as well. The purpose is to show our union with him in his faith, which becomes our saving faith, says Richardson. It is, in other words, the faith of Christ, not our own faith, which justifies and saves.11 This union with Christ is not a product of human faith, but faith is a product of a prior union between Christ and the elect. Richardson’s notion of election rests on the assertion that God is love, rather than a theory of predestination. The love of God is infinite, and therefore God has always loved the elect, even before they believed: “[T]he elect were ever in the love of God, and did ever so appear to Him as just and righteous in and by Christ”, says Richardson. God has never been at enmity with his people, even when he hides and seems angry. In defense, Richardson frequently quotes the words of 2 Timothy 1:9 on the grace that “was given us in Christ Jesus before the beginning of time”. Richardson does not use the term “justification from eternity”, but he comes close, arguing that justification is first to be considered “in the will of God”, which had no cause or beginning before it, being eternal and infinite. From the fact that God’s will is eternal, the elect are said to be saved “before the world”. This is a justification “in purpose”, which precedes the “act or execution” of it in Christ, where justification is “actually done”.12 But the mere purpose of justification seems to be identical with the justification it anticipates, which is why the justified can be said to always have appeared so in the sight of God. Though nothing is said about the philosophical presuppositions for these claims, this idea clearly resembles Platonizing theologies, where the eternal forms are said to be always present in the mind of God. As with Crisp it is clear that for Richardson the eternal justification of the elect was not abstract speculation without spiritual relevance, but a matter of pastoral care. Richardson opposes every tendency to place the event of justification in a feeling of assurance, as he argues that justification in the conscience is not justification itself. In other words, we need not fear, that we are not justified, even though we do not feel the full comfort of our justification yet. Assurance of justification is necessary to our comfort, but justification does not depend upon our knowledge of it. To make God’s forgiveness depend on the intensity of human repentance is to substitute human works for Christ. But “[w]e have made a Christ of our works, tears and crying long enough”, says Richardson in his Divine Consolations from 1649.13 This resonates with Crisp’s so-called anti-nomian view, that the “terrors of the law” are not required before the gospel can be preached. That Richardson was far from being the only Baptist to hold such views is evident from William Kiffin’s foreword to Richardson’s treatise on justification. The first London Confession contains traces of similar conceptions of the role of the law and faith as the manifestation of a prior justification. The so-called anti-nomian perspective is apparent from its claim that the gospel is said to in “no way” require the “terrors of the law” for the sinner to receive Christ, while faith is said to be the “manifestation” of justification.14 Edward Drapes, another early Particular Baptist, also defended ideas integral to the doctrine of justification from eternity in his Gospel Glory from 1649. Drapes developed his arguments in opposition to certain forms of spiritualism, that saw the cross as an inner experience, rather than a done historical reality.15 But “Christ’s death at Jerusalem is the offering for sin”, says Drape, “not Christ’s death in any one’s heart”. The “virtue” of Christ’s death can even be said to be from before the foundation of the world, as Christ in accordance with the King James translation of Revelations 13:8, was “slain before the foundation of the world”. There was a covenant made between God and Christ wherein it was decreed that Christ should die in time, but the virtue of that death was from eternity in the eyes of the Father. Christ’s death had an influence into times past as well as those to come. Thus Christ’s death was an eternal sacrifice. It was offered in time, but the influences of it reached eternity, as the sacrifice was fully accepted by the Father, who viewed it since it was offered. What is only actually done with us in time, was truly present with Him before all time, who is not included in any time. The notion that justification is prior to faith even reappears in John Bunyan’s The Pharisee and the Publican from 1685. Though Bunyan’s Pilgrim’s Progress may be the unrivalled illustration of the ordo salutis, its author seems to have held to a conception of the ordo diverging from the orthodox. If we are justified only after coming to faith, then this means that the Holy Ghost, which works faith in us, must dwell in us before we are justified, argued Bunyan, who distinguished between justification before God on the one hand, and justification to the understanding and conscience on the other. A man may be justified before God, even when he himself “knoweth nothing thereof” and while “he hath not faith about it, but is ungodly”16, said Bunyan, while bemoaning the readiness of the spirit of the world to cry out against those who preach the “freeness and fulness of the Gospel”.17 The basic pastoral concerns of his precursors seems to have been shared by Bunyan here. The next generation to espouse these views was the English Baptist preachers John Brine (1703-1765) and John Gill (1697-1771). While justification from eternity had only played an ad hoc role in Crisp’s and Richardson’s thinking, with Brine we see it developed as a core doctrine under the heading ‘eternal justification’.18 The pivotal idea here, being crucial for Gill also, was that justification is an immanent act of God. Brine, who succeeded John Skepp as the pastor at Currier’s Hall, Cripplegate, explained this in his treatise A Defence of the Doctrine of Eternal Justification from 1732.19 Justification is alone a matter of how God sees a person. From this follows that God’s decree to punish sin in His Son rather than in His elect, is in itself the justification of the elect in the sight of God. Justification is consequently also an eternal act, meaning that the elect qua elect are eternally beheld as justified in the mind of God. As no act of man can be an instrument in those acts of God which are immanent, faith understood as an exercise of the human will, is in no way instrumental in justification. When Paul said that faith was reckoned to Abraham for righteousness, Brine, with reference to Maresius, argues that the “faith” in the context of Romans should be taken “metonymically” for “Christ being apprehended by faith” as in Galatians 3:25.20 As an act or work of ours, faith cannot be “the matter” of justification, says Brine. While faith may be reckoned our own, as we are the subjects of it, the righteousness by which we are justified is not our own. Faith receives the righteousness that justifies, but it cannot be righteousness itself or the “impulsive”, “moving cause” of justification, which is an act of pure and free grace, without any motive in the creature. Faith “beholds and views” justification, but does not “give being” to it by imputing the righteousness of Christ. Justification by faith is the “comfortable knowledge” or “perception” of that “gracious privilege”. Faith is not, however, in itself a manifestation of God’s eternal love. If it was, we would have a constant sense of God’s love to us, says Brine. The external manifestation of God’s favor and election is in the gospel, while the internal manifestation is by the Spirit. But faith only perceives the manifestation of God’s love as revealed in the gospel and in the Spirit. For this reason, it is possible that one believer has a fuller discovery and assurance of his justification than other. These ideas was further developed by John Gill in a chapter of his Doctrinal Divinity named “Justification as an Eternal and Immanent Act of God”.21 Being an “immanent act in the divine mind” justification is not just before faith, but from eternity, says Gill, as he identifies that which is immanent to the divine mind with that which is “from eternity”.22 If God’s plan to justify sinners is not by itself already a justification of sinners, then justification happens outside God, making it either intrinsic to human beings or a relation between human beings and something which God does not completely control, e.g. a moral law. But according to Gill the eternal justification of the elect rests solely on the eternal union between the elect and Christ flowing from the love of God.23 Justification follows from the eternal union of the elect with Christ in the will of God to justify sinners on the cross. Justification happens from eternity as God’s decision to justify the elect is in itself a justification of the elect, says Gill. But it also happens in time. Christ had the sins of the elect imputed to him when he died on the cross, and they were justified again, when Christ in his resurrection was justified “as a public person”.24 Justification in time, understood as the public declaration of an already existing righteousness, further happens by faith in the consciousness of the justified, on the one hand, and by works in the eyes of others, on the other hand. By this distinction Gill manages to harmonize the idea of justification from eternity with Paul’s remarks on justification by faith in the Epistle to the Romans as well as the notion of justification by works in the Epistle of James. Again there seems to have been pastoral concerns, as this distinction makes it clear that our eternal righteousness neither depends on our degree of faith or good works in time. At any rate, these ideas of justification had practical consequences for how the gospel was to be preached. Gill asserted that if there is no revelation made unto a person, then no faith is required of that person.25 Brine also argued that faith is not a demand of the law, since faith is not “a righteousness free from imperfection”. It may just as well be required of sinners to form divine and supernatural principles in their own souls as to “get faith”, said Brine, for both are works proper to God. The exhortation to “get faith” does not debase and humble proud sinners, but rather swells them up as they imagine that they are “possessed of a power which they are not”. The doctrine of justification from eternity did not, however, become the exclusive property of the primitives, as it reappeared in the writings of Dutch neo-Calvinist minister Abraham Kuyper.28 This sparked some controversy in Dutch reformed theology.29 Though acknowledging its sincere “religious” motivation, G.C. Berkouwer criticized the doctrine for what he perceived as a tendency to move justification and redemption out of time into eternity.30 As everything occurring in time merely formalizes or illustrates what has been “molded in eternal quietness”, even the reality of the cross is swallowed up in the still waters of eternity, argued Berkouwer, noting a “remarkable correspondence” between the anti-nomianism associated with the doctrine and the conception of time and eternity in the kind of idealism that debases time and history, as well as God’s acts in history. There is, argued Berkouwer, no place for an eternal justification side by side with a justification in time. Berkouwer concluded that we need to center on the historical revelation of God in Christ rather than on his eternal decrees outside revelation. Following these objections it seems that justification must be understood much more dynamically, as a real change taking place historically. The charges of anti-nomianism easily follows if this is not the case, as the doctrine of justification from eternity can easily be misunderstood as implying that the elect were never really considered unrighteous. This objection was made by the Particular Baptist preacher Benjamin Keach (1640-1704) in a dialogue between ‘Godliness’ and ‘Antinomian’, as it was argued against the doctrine that persons cannot simultaneously have the status of unjust and justified.31 The point was not here, that the justified are not also sinners (as in simul peccator et justus), but that justified sinners cannot also be considered as having the status of unjust. But if justification is from eternity, this is exactly the case. While for Keach this counted against the doctrine of justification from eternity, the objection suggests that it must be understood dialectically in the sense of holding two opposite truths about human beings simultaneously. Human beings are simultaneously counted as unjust (perceived in themselves, as the old Adam) and just (as perceived in Christ). There is, however, admittedly something quite Platonic to the idea of justification from eternity as it was often construed. God was said to be timeless and immutable, he does not change, his decrees are settled once and for all, and so on, which is why justification must also be eternal. But following contemporary post-theism it could easily be argued, like Berkouwer did, that the philosophical conception of eternity as abstract timelessness and immutability cannot really be used in a biblical notion of justification. Jürgen Moltmann has argued that a true trinitarian theology must be based on the revelation of the incarnate Christ that dies on the cross rather than on classical theism’s metaphysical notions of an abstract, immutable God that does not engage in human history.32 In so far the doctrine of justification from eternity seems to depend on such an abstract metaphysical theism rather than the living God of the Bible, it may be argued that a truly biblical theology does not leave much room for the doctrine’s conception of justification. The doctrine of justification from eternity does not replace traditional protestant or evangelical doctrines, but radically changes them from within. Most fundamentally it changes the ontological status of historical events from causes into signs: Conversion, faith and works are never causes, but signs of something which is already the case prior to the sign. In important difference from the Puritan ordo salutis, these are not, however, necessary signs, but contingent expressions of an eternal truth that is quite independent of any sign. The gospel is good ‘news’ in the sense that it uncovers a grace that was literally given “before the times of the ages” (2 Timothy 1:9-10). But if we are to avoid the dangers of a too rigid Platonism, we need to explain how this does not leave history void of meaning. The false dichotomy between making justification dependent on historical factors on the one hand or making it a static, transcendent and abstract truth on the other, should be avoided. For a reconstruction of the doctrine to work we need a renewed reflection on the relationship between time and eternity. The cross of Christ must be made the basis on which all theological statements about God is made (Moltmann).33 It could be argued that this is exactly what the doctrine of justification from eternity does, as it makes the justification of sinners on the cross foundational in our understanding of eternal truths. Gill at least suggested that justification from eternity implies a kind of sublapsarianism, as God is said to justify the ungodly (Romans 4:5), i.e. the elect conceived as sinners.34 Justification is as such eternally true because it anticipates the cross and the resurrection as historical events. Eternity, we might say, anticipates or even takes place in humanity’s union with Christ on the cross as the center of history, determining everything else. Saying that justification is ’from eternity’ may not just mean ’from infinite time before creation’ but could also be taken to mean ‘from the eternal God’. The point is to emphasize that justification is alone a work of God, as when Gill and Brine argued that justification is an immanent act of God and is thus not dependent on historical circumstances. Justification happens, to use a phrase from Karl Barth’s commentary to Romans, in the “eternal moment”, in which humanity is transferred from death to life.35 But this does not make historical reality superfluous or a mere reflection of eternal truths, as this eternal moment takes place historically in the cross of Christ. Christ’s death happened in time, but it was an eternal sacrifice as the influences of it reached eternity (Drapes).36 The ‘eternality’ of justification does not depend on the metaphysics of classical theism, but on the fact that the cross and the resurrection has revolutionary consequences for all of human history. That we are justified from eternity simply means that God is in Christ always the crucified God, to borrow Moltmann’s phrase. The merits of the doctrine of justification from eternity is that it collapses all artificial scholastic distinctions between the sufficiency and efficiency of the atonement. All for whom Christ died are effectively justified. Repentance and faith are not conditions that are to be fulfilled to make justification efficient. But what rightly raises the concern of many is the particularism in many cases associated with the idea, as it was often persistently argued that Christ only died for the elect, and not for the whole world.37 It is especially noteworthy how John Gill in his comments to Crisp’s sermons frequently seems to have felt a need for explaining how Crisp’s strong claims about grace, were only true for the elect. But Gill’s persistence is, perhaps ironically, enough to suggest, that a non-particularistic understanding of justification from eternity is actually quite plausible. An alternative to the soteriological particularism often associated with the doctrine can, perhaps surprisingly, be found in parts of the self-same Baptist tradition which engendered it, e.g. Samuel Richardson, mentioned above. Though much of his work suggests a notion of election much in line with 17th century Reformed and Puritan orthodoxy, his main concern was hardly particularism, but the unconditionality of grace. In his final work, A discourse of the torments of hell, Richardson argued that ‘hell’ does not mean an endless state of torture after death. Though seemingly suggesting the final annihilation of the godless, Richardson in conclusion argued that there are in fact no limits to God’s grace: “It is more for his glory to save all, than to save a few”.38 This perspective was taken up by Primitive Baptist Universalists, who, perhaps influenced by 18th theologians James Relly and James Murray, held that ’the elect’, are not so at the expense of the non-elect, but simply those to whom the universal truth of the gospel is revealed here and now, “in time”.39 The separation following from the judgment on the cross and in the resurrection is not one between actual individuals, but between the old, unjust creation in Adam and the new, righteous creation in Christ. Following this perspective, while all are eternally justified in Christ, only the elect are justified and saved here and now in time. As implied in the concept of “time salvation”, sometimes associated with Primitive Baptist theology, salvation in time is conditional upon hearing and believing the gospel. Salvation means, in line with Hebrews 2. 15, to be saved from the fear of death, when believing that Christ has conquered death. Justification from eternity does not make preaching superfluous, but salvation happens concretely as human beings hear the gospel and understand their justification in Christ. As held by the Primitive Baptist Universalists, ‘saved’ believers are distinguished from the ‘unsaved’, simply by enjoy the comfort of knowing their salvation here and now, while unbelievers are still unaware that they are already saved in principle. On this basis, the particular election of concrete individuals should be understood in teleological (or eschatological) terms. As 18th century American Baptist preacher Elhanan Winchester argued, there is both a particular and a general redemption: The church is redeemed in particular in order to preach the gospel for the rest of the world, which was redeemed in general.40 This general redemption of the world becomes partly manifest historically as people come to faith by hearing the gospel, but fully at the eschaton at the end of the aeons. But is the doctrine of justification from eternity relevant for contemporary issues in theology and church? As suggested above, it is. At least some of the concerns of someone like Richardson, Brine and Gill was shared by 20th century ‘Neo-Orthodox’ theologians such as Karl Barth and T.F. Torrance, who similarly argued that justification precedes faith.42 Thus, the doctrine of justification from eternity may facilitate a fruitful dialogue between Neo-Orthodox theology and the older Baptist tradition. The doctrine presents a radical alternative to the rampant subjectivism of contemporary conceptions of faith, which Neo-Orthodoxy also rallied against. Both present an account of justification and faith that sees human subjectivity as meaningful only as founded in the reality of a prior divine grace. James McClendon claimed that the debates on predestination and election is foreign to the broader Baptist tradition (‘small b-baptists’), which is characterized by a narrative understanding of faith rather than reflection on doctrine.43 While this is an important observation, the risk of the narrative approach is, however, that it assumes a too subjectivist notion of faith. When telling stories, we easily put much weight on historical circumstances in the life of the believer. Perhaps the doctrine of justification from eternity can be a way of remedying this, by framing or putting the narrative into a larger perspective, so to speak. The doctrine does not diminish the importance of narrative theology, though it sees the deeper meaning and truth about our lives to be outside the narrative. This is what lets the narrative be narrative, and nothing more, nor less: We can confidently tell stories about our life, knowing that the truth about our existence does not ultimately depend upon the exact details of the narrative. The date and time of our conversion is of lesser importance compared to our ongoing story with the God who loved us before we were born. Just as important is the assurance that our story with God has a future even if there are gaps in the narrative. The doctrine of justification from eternity has the potential of cutting through judgmentalism and doctrinalism as it makes it impossible to evaluate the status of persons in the sight of God based on their expressions of faith, holiness, confession, church attendance and so on. It also means that the ‘success’ of the cross does not depend on the initiative of the church. The church can do its work because the cross is already successful. Being a witness in the world does not mean to preach a “turn or burn gospel” that can hardly be considered good news. To preach the gospel means to speak about what God has already effectively done in Christ prior to all conversion and repentance. Rather than trying to defend the doctrine of justification from eternity against the charges of anti-nomianism, why not respond, ‘yes, this is anti-nomianism, though in a very specific sense’? The so-called anti-nomianism following from the doctrine actually makes good sense in a secular or post-secular context, where the main existential question asked by the unchurched is often not “how do I get a gracious God?” (Luther). Perhaps it is rather a search for a deeper truth that can embrace the fragmented lifes of post-modernity, that must be met by the church’s preaching. The gospel does not depend on the ‘law’ or other contingent historical circumstances. That we are justified from eternity means that the church does not need to teach the unchurched about the the law and the wrath of God before preaching the gospel. That we are justified from eternity – always already loved by God – in spite of everything, is the eternal truth about human life that the church must preach to the world. 1See “Evangelicals’ Favorite Heresies Revisited by Researchers” in Christianity Today (September 28, 2016). 2The popularity of neo-calvinism (e.g. John Piper) in parts of evangelicalism can perhaps be explained by a dissapointment with liberal ideals of human autonomy. But as formulated in a framework where justification is still said to happen as a result of the exercise of faith by the human will (free or not), neo-calvinism offers no real alternative. 3Karl Barth, Deliverance to the Captives (Eugene: Wipf & Stock, 2010), p. 31. 4As it was only later formulated as a ‘doctrine’, it must be excused if the following attempts at an ‘archeology’ of the idea of justification from eternity involves some degree of anachronism. It should also be considered that the idea that justification happens ‘from eternity’ was far from peculiar to Baptist thinkers, who frequently borrowed from reformed theologians of other denominations. The most of these will be left out in the following, in order to focus on the Baptist reception of the idea. 5This tradition has also by contemporary scholarship been termed ‘Hyper-Calvinism’. See Peter Toon, The Emergence of Hyper-Calvinism in English Nonconformity, 1689-1765 (London: The Olive Tree, 1967); James Leo Garrett, Baptist Theology: A Four-century Study (Macon: Mercer University Press, 2009), pp. 89ff. 6John Eaton, Honey-Combe of Free Justification by Christ Alone (1642), quoted heavily from Luther. Though scarcely quoted in Crisp’s sermons, Crisp also seems to have been inspired by Luther’s attacks on works righteousness. Tobias Crisp, Christ Alone Exalted (London, 1643). 7David Parnham, “The Covenantal Quietism of Tobias Crisp” in Church History, Vol. 75, Issue 3 (Cambridge: Cambridge University Press, 2006), pp. 511-543. 8Quoted in Daniel Steele, A Substitute for Holiness; or, Antinomianism Revived (Eugene: Wipf & Stock, 2016), p. 139. 9A defense of Crisp can be found in Samuel Richardson, Divine Consolations (London, 1649). 10Samuel Richardson, Justification by Christ Alone (London, 1647), Chapter 2, obj. 16. 11Richardson 1647, Chapter 3, obj. 18. 12Richardson 1647, Chapter 5, obj. 25. 13Samuel Richardson, “Divine Consolations” in Collected Writings 1645–1658, Vol. 1 (Lulu.com 2016), p. 442. 14First London Confession 1644, §25; §28. Cf. the 1689 Baptist Confession (based on the Westminster Confession), §11,4, where the elect are said not to be personally justified until Christ is “applied”. 15Edward Drapes, Gospel Glory (Francis Tyton: London, 1649), pp. 43f. Drapes’ opponents may have been Schwenkfeldians or other spiritualists who developed into Quakerism. 16John Bunyan, “The Pharisee and the Publican” in The Works: Being Several Discourses Upon Various Divine Subjects, Vol. 2 (London: Gardner, 1737), p. 709. 17John Bunyan, The Doctrine of Law and Grace Unfolded (London, 1659), p. 2. 18Another influence may have been Joseph Hussey (1660-1726). Hussey understood Galatians 2. 16 as saying that we are justified “by the faith of Jesus Christ” and took it to mean that the elect are justified in Christ before coming to faith. See Joseph Hussey, The Glory of Christ Unveil’d, etc. (London, 1706). 19John Skepp (1675-1721) is often associated with so-called Hyper-Calvinism, but I have not found evidence that he taught the particular idea of justification from eternity. 20Brine refers to “Hydra Socin., Vol. III, Maresius, Ch. xxi., p. 604”. 21For more on Gill’s version of the doctrine, see George M. Ella, John Gill and Justification from Eternity: A Tercentenary Appreciation 1697-1997 (Go Publications 1998). 22Cf. Karl Barth, CD IV.1 (London: T&T Clark, 1975), p. 554ff. “That we live as righteous men is not an immanent determination of our existence […] In Him I am already the one who will be this righteous man”. 23Gill lists four ways in which this union takes place. John Gill, The Doctrines of God’s Everlasting Love to His Elect, etc. (London: Aaron Ward, 1732). 24John Gill, A Body of Doctrinal Divinity (London, 1769) II,5,2. 25John Gill, Faith in God and his Word, etc. (London, 1754), p. 31. 26Andrew Fuller, The Gospel Worthy of All Acceptation (1786), part II, prop. 3; The Complete Works of Rev. Andrew Fuller, Vol. 2 (Boston: Lincoln, Edmands & Company, 1833), p. 286. 27Iain H. Murray, Spurgeon v. Hyper-Calvinism (Carlisle: Banner of Truth Trust, 1995); Alexander Asciutto, “Charles Spurgeon’s Ambivalent View on Justification” on www.mercyuponall.org (11/6 2018). 28Abraham Kuyper, The Work of the Holy Spirit (Grand Rapids: Eerdmans, 1946), pp. 367ff. 29Louis Berkhof, Systematic Theology (Grand Rapids: Eerdmanns, 1953), p. 267. As eternity precedes time, being a divine act of grace effected outside of us, justification must also precede faith. Justification does not “spring” from the consciousness, but is “mirrored” in it. 30At least as it was formulated by Alexander Comrie in response to a “neo-nomianism” that saw faith as an act of human beings, making them partly responsible for their own justification. G.C. Berkouwer, Faith and Justification (Grand Rapids: Eerdmans, 1954), p. 148. 31Benjamin Keach, The Travels of True Godliness (1683) (1831) , pp. 125ff. 32Jürgen Moltmann, The Crucified God (Minneapolis: Fortress Press, 2015), p. 313ff. 34John Gill, The Doctrine Of Justification, etc. (London: George Keith, 1750), §1. 35Karl Barth, Epistle to the Romans (Oxford: Oxford University Press, 1968), p. 404. 36Edward Drapes, Gospel Glory (Francis Tyton: London, 1649), pp. 43f. 37The particularistic idea of a limited atonement is arguably at odds with Romans 5. 18-19. See Thomas Talbott, The Inescapable Love of God, 2. ed. (Eugene: Cascade Books, 2014). 38Samuel Richardson, A discourse of the torments of hell (London, 1658), p. 95f. The first edition is unnamed. It might in principle be a different author, but there are linguistic similarities to Richardson’s earlier works. 39See Howard Dorgan, In the Hands of a Happy God: The “No-Hellers” of Central Appalachia (Univ Tennessee Press, 1997); James Relly, Epistles, etc. (London, 1776), p. 27ff. James Relly held, like Barth later, that Christ is the one elect of God in whom rejected humanity is judged by participating in Christ’s death, but justified by participating in his righteousness. 40Elhanan Winchester, The Gospel Preached by the Apostles (London, 1788). 41The German expression ‘immer schon’ has in 20th century philosophy been applied to that which is always true of our existence in every moment of time even before we are aware of it. 42“Through union with him we share in his faith […] Therefore when we are justified by faith this does not mean that it is our faith that justifies us, far from it – it is the faith of Christ alone that justifies us […]”. Thomas F. Torrance, Theology in Reconstruction (Eugene: Wipf & Stock, 1996), pp. 159f. Moltmann states that “[i]t is not my faith that creates salvation for me; salvation creates for me faith.” Jürgen Moltmann, The Coming of God (Minneapolis: Fortress Press 2004), p. 245. 43James McClendon, Systematic Theology: Ethics (Nashville: Abingdon Press, 1986), p. 23.